Brick-and-mortar retailers—including supermarkets, discounters, drugstores, and mass merchandisers—rely heavily on promotions, which typically account for 10 to 45 percent of their total revenues. Although promotions are a powerful instrument for increasing sales and margin, they are also difficult to use effectively. One reason for this is a lack of clear insight into which promotions are working—and why. The Boston Consulting Group’s research indicates that 20 to 50 percent of promotions generate no noticeable lift in sales—or, worse, have a negative impact. Another 20 to 30 percent dilute margins in that they don’t generate an increase in sales sufficient to offset promotion costs. To help retail companies run fewer, more effective promotions, we have developed a four-part approach to improving promotion planning, evaluation, and execution. By adopting these practices, companies can increase the margin on promotions by 2 to 5 percentage points and position themselves to win in an increasingly challenging retail environment. Retailers face strong pressure to grow, and running promotions is a proven way to increase top-line sales. As a result, most retailers run thousands of promotions a year, past the point of diminishing returns. Even though many promotions lose money, retailers are hesitant to scale back the volume, primarily because they don’t know which ones are working. Running so many promotions, however, undermines their strategic potential: to create a competitive edge in a market. Changes in the retail environment are only encouraging retailers to maintain the volume of promotions. Online retailers are taking business away from brick-and-mortar stores, which is evidenced by e-tailers’ compound annual growth rate of more than 20 percent since 2009, compared with only 4 percent for brick-and-mortar retailers. This disparity is likely to persist, and e-tailing’s share of the retail sector is expected to continue rising for the foreseeable future. Furthermore, digital promotions, such as those distributed through e-mail, mobile ads, and printouts from point-of-sale devices, are becoming more prevalent and increasing the complexity for retailers. For example, many retailers are being distracted by the potential for customized offers that target individual shoppers with unique promotions on the basis of their shopping history, preferences, and other factors. However, customized offers are still a remote prospect for most traditional retailers. In such a challenging environment, retailers need to take systematic steps to improve the performance of their promotions. By doing so, they can improve their top line and bottom line—and distance themselves from the competition. Success requires starting with promotion basics: building a comprehensive strategy, advancing employees’ capabilities, and developing tools and processes to measure performance and to use that information to improve promotions over time. Our research indicates that if retailers fix the basics and better evaluate promotions, they can reduce the number of promotions that dilute margins—and especially sales—and increase the percentage of value-adding promotions. (See Exhibit 1.) Although digital promotions are one aspect of a more effective approach to promotions, they are not a cure-all. Spending on traditional media will remain a critical component of promotion1 for most retailers, until digital promotions mature. Suzanne Kapner, “Retailers Can’t Shake the Circular Habit,” Wall Street Journal, March 11, 2015. Several pitfalls typically hinder the success of promotions: failing to create a promotion strategy; having little understanding of true performance; lacking lean, fact-based processes; and having insufficient organizational capabilities. Accordingly, our approach to improving promotion performance addresses all four. Craft a winning promotion strategy to guide category-level decisions. For many retailers, the promotion process is heavily focused on implementation rather than strategy. Many retailers lack a clear goal for their promotions; management does not consider whether it is trying to improve margins, traffic, customer loyalty, or some other metric. As a result, a promotion plan is often based on what was done last year rather than on a systematic analysis of historical performance to determine if specific promotions are meeting the company’s strategic objectives. Repeating promotions is an easy and safe approach to planning, but it limits the ability to evolve promotions and improve their performance over time. Instead, retail organizations should focus on establishing a promotion strategy that aims to achieve a specific objective, such as spurring traffic, increasing basket size, improving price perception among customers, raising profits, boosting customer loyalty, or enhancing brand awareness. Generating incremental sales is the most common goal, but the “right” objective is one that fits into the company’s overall business strategy. After crafting the promotion strategy, the next step is to determine the role that each product category will play in that strategy, along with the investment required. For example, consider a supermarket that determines that the fruit-​and-​vegetable category can generate incremental sales. To determine how to get the optimal gain in sales, the retailer first needs to understand the promotion investment required for each dollar of additional sales in that category. By coupling customer research with in-store testing, the retailer can pinpoint the promotions that would draw new customers into its stores and the promotions that would boost sales among existing customers. The retailer could also use these research results to determine the investment required to generate each additional dollar of sales in this category. Retailers should also look at the promotion spending of their top competitors in each category to determine the appropriate level of investment. After defining the level of investment for each product category, an organization needs to determine how it can most effectively allocate that investment. For example, does the retailer adopt a strategy of consistently low prices and eliminate promotions, or does it have higher prices that get marked down during promotions? The right approach likely depends on the product category. For some categories, a retailer may opt to reduce the shelf price permanently rather than rely on promotions. For others, the retailer may choose higher shelf pricing and discount the price through promotions. Retailers can determine how best to allocate their investment in a particular product category by using three main parameters to assess pricing and promotions: the impact on sales (how much each approach will affect sales or market share), the impact on margin (how much each investment approach will affect the return on investment, or ROI), and the impact on consumers (how each approach will affect foot traffic, loyalty, and the perception of value). Deploy big-data analytics to produce actionable recommendations. Most retailers don’t know the true performance of specific promotions—or the value they create—and thus struggle to select promotions that will achieve the company’s objectives. In part, the issue is data quality—retailers’ sales data is often incomplete, inaccurate, or flawed in some other way that makes it difficult to analyze. In addition, some sales data may be inaccessible. Nevertheless, even if a retailer has perfect and accessible data, most analytic tools show only historical performance; they don’t recommend changes or provide the information that management needs to improve a promotion’s outcome. As a result, retailers don’t know which promotions to strengthen, fix, or cut. To select effective promotions, companies need to put in place big-data capabilities that enable them to gather comprehensive information about promotions. Retailers also need to embrace big-data analytics, which sifts through that information and provides useful insights. Such analytics will also help retailers answer a basic question: What is a “good” promotion? Currently, many retailers evaluate only actual sales from a promotion rather than incremental sales—and those that do analyze the latter struggle to determine the real incremental margin realized. As a result, these retailers are unable to determine the ROI, and they are thus making various promotion decisions on the basis of partial (or flawed) information. Only by analyzing the data for all of the elements that affect sales and margins can a retailer determine the real performance and incremental value of a promotion. A retailer should first determine the baseline sales that it would have realized without running the promotion. (See Exhibit 2.) Then the retailer should identify the incremental sales that were generated during the promotion. The analysis then requires factoring in the discounts, supplier funding, cannibalization (the sales that promoted items took away from similar products), complementarity (the boost in sales from complementary products), “stock-ups” (the loss of future sales at full price because customers bought a product in volume at a discount), advertising costs, supply chain expenses (such as incremental freight or distribution), and store costs (such as employee time). Promotions That Increase Sales and Margin. These are the most successful promotions, showing a positive impact across both dimensions. Promotions That Dilute Margin but Increase Sales. These promotions have a minor negative impact on margin but have a high positive impact on incremental sales. To determine if these promotions are worth continuing, calculate their targeted ROI—in other words, the amount in incremental sales that is required for every dollar of margin invested. Expensive Promotions. These have a negative effect on margin and don’t boost sales sufficiently to be worth the investment. Promotions That Dilute Sales. These promotions are the least favorable, since they reduce sales. Low-Impact Promotions. These promotions don’t increase sales or margin enough to warrant running. In addition to taking into account the results of margin analysis, retailers also should consider the effect of a promotion on profitable customer traffic. That is, does the promotion bring new customers into the store, and if so, do those customers buy other high-margin products, come back, and spend more on each subsequent trip? To understand promotion analysis, consider a real-world example in which a supermarket category manager analyzed seven promotions in the egg category. According to the retailer’s category guidelines, a particular egg product consistently brings customers into the stores. Hence, the category manager can accept negative incremental margin when selecting a promotion. To develop clear insights that would help shape future promotions, the category manager assessed the performance of the prior promotions by the amount of incremental sales and incremental margin they delivered. (See the exhibit below.) Specifically, the manager’s analysis showed that single-unit-discount promotions with a 30 percent reduction in price have the best margins; these promotions should continue. By contrast, promotions that use the same discount but with a 50 percent price cut give away more value yet generate fewer incremental sales; the manager should stop running these promotions. In addition, the manager discovered that although some promotions were expensive, they still deliver a lift in sales. Therefore, supplier funding should be secured to continue running those promotions. Design a promotion process to embed discipline throughout the organization. When developing and rolling out promotions, retailers often face conflicting perspectives and interests. For example, should a company optimize promotions for individual manufacturers or for the ROI of the category? Choosing the former decreases the effectiveness of promotions because manufacturers focus on the unit volume, whereas retailers should focus on the category margin. Set up the promotion function and team and assign clear responsibilities. Develop the necessary tools to support the promotion process. Create KPIs to foster the right behavior. Establish a framework and process for reviewing and approving the promotion selection. Build up organizational capabilities to better execute promotions. A central challenge for many retailers is that they don’t have the right organization structure to support promotions. For example, most retailers don’t have the foundational capabilities and a dedicated team in place to effectively oversee promotions from start to finish. As a result, the rest of the organization does not receive the training necessary to execute promotions and never builds the foundation required to improve promotion performance. A large food retailer relied significantly on promotions to spur sales. The company spent more on promotional activity than any other player in the market, with promotions accounting for 40 percent of its revenues, on average, and as much as 70 percent in several categories. Despite the high usage, the company had a limited view of the true economics of its program, and management could not determine which promotions performed well and which did not. Several factors contributed to the problem, including a lack of robust tools to provide an accurate view of incremental sales and margins from promotions, as well as KPIs that focused only on absolute sales. Worse, the company’s selection process for promotions was heavily influenced by suppliers, and in situations where the retailer had greater control, it focused primarily on repeating previous promotions. We analyzed the true value generated by the retailer’s past promotions. On the basis of that analysis, we developed specific category recommendations to improve promotion performance, including which products to promote, which promotion option to use, which discount level to apply, and in which channel to promote the products. By implementing these ecommendations, the retailer added $166 million in incremental profits per year, without compromising sales in the categories in which it had improved promotion performance. Those funds were reinvested to reduce prices on the most important product lines for the company’s customers. In less than a year, the retailer went from being one of the fastest-declining competitors in its market to one of the fastest growing. Moreover, the company now has capabilities in place that allow it to consistently improve promotion performance over time. There is significant value on the table for the retailers that can improve their promotion effectiveness. Through a sustained effort, companies can build up the internal capabilities, tools, and systems they need to more effectively evaluate and select promotions, roll out future promotions, and ensure that the entire process is aligned with their overall business strategy. 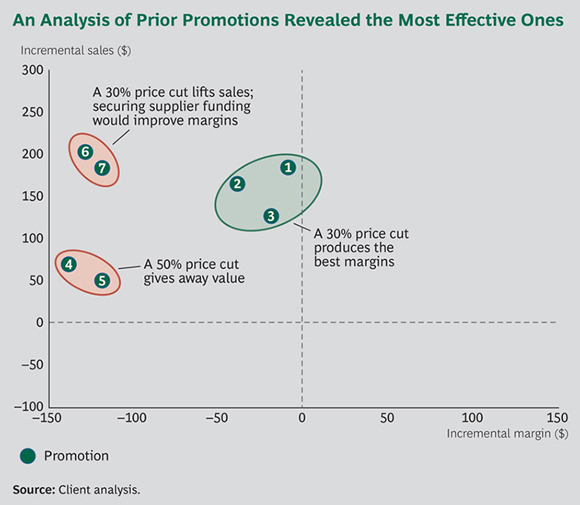 This four-part approach can help retailers improve the margin earned on promotions by 2 to 5 percentage points and position themselves to win in a more challenging retail environment.